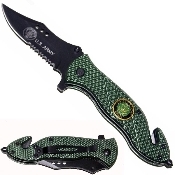 Spring Assisted Pocket Knife - Heavy duty rescue knife with enamel United States Army medallion mounted into the all metal sure-grip textured handle. Razor sharp 1045 (tool steel) half serrated scimitar blade with thumb stud and emblem. Handy pocket/belt clip. Spring Assisted - Touch the back, and it flies open and locks in place. The included seat belt cutter and window breaker make this a valuable rescue tool.